Nature's coolest disaster: the fire tornado! 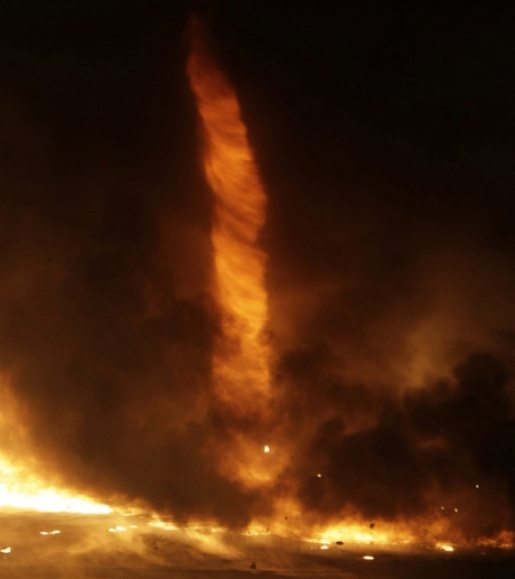 There’s nothing cooler than a fire tornado, but they’re incredibly rare. In a way, they’re like ligers, but more destructive and less magical. Still, any fire tornado captured on film makes for a very dramatic image, and this most recent example of a fire tornado is no different. A fire at a plastics processing plant in Kistarcsa, Hungary, resulted in these awesome images of a fire tornado sprouting up from the flames. It’s awesome how great that image is, right? I just hope there’s some fire tornado video out there somewhere, because it’s such a visually-stunning picture that any video would have to be twice as awesome, because pictures are worth a thousand words, and moving pictures are worth a thousand pictures. The fire in Kistarcsa, a suburb of Budapest, required 70 firefighters to contain it and it consumed the entire industrial complex where the processing plant was located. A cause for this particular fire whirl has not yet been determined, but I suspect voodoo of some sort.